Hoax? Viral marketing? or major scientific breakthrough? Texas company DNA Diagnostics, headed by veterinarian Dr. Melba Ketchum, has announced that they have sequenced not one, but three different Sasquatch genomes. Dr. Ketchum has applied for a patent for a method of genetic analysis of wild and domestic animals, which suggests expertise in DNA analysis. Their claim is that not only that the Sasquatch is humanoid, but that they are hybrids between human females and "unknown" male hominins. “Genetically, the Sasquatch are a human hybrid with unambiguously modern human maternal ancestry. Government at all levels must recognize them as an indigenous people and immediately protect their human and Constitutional rights against those who would see in their physical and cultural differences a ‘license’ to hunt, trap, or kill them." So not only some amazing claims but a strong message about ethics to go with them. Over at Teen Skepchick they have dug into the details that are available about Ketchum and Robin Lynne, who put out the press release. It turns out Lynne has made a number of claims about a large Sasquatch family that she has interacted with on her property. But her evaluation of the evidence is beyond reproach. Apparently she went out one day to her feeding box to find it locked, and when she opened it, the food was gone but there was an opossum inside. She naturally concluded that the Bigfoot family had put the creature in there and locked the box as a joke. Apparently the original manuscript also claimed that they found "angel DNA" in the samples. The more I read the more this sounds like the work of some serious deluded individuals who may have analyzed a sample of wild animal DNA contaminated with human DNA. Or maybe this is truly a history discovery (but I think not). 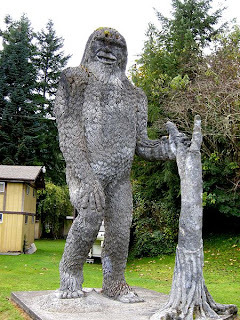 Image: Bigfoot statue in Silver Lake, Washington. 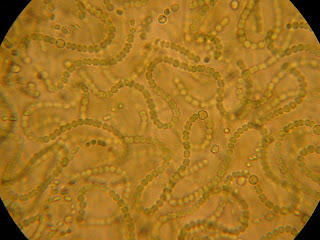 by Plazak on Wikimedia Commons licensed under the Creative Commons Attribution 3.0 Unported license. May not be scientifically accurate. I don't think it should be a surprise to anyone that humans are evolving. Evolution is not a ladder where humans have reached the top and will never change again. But a recent detailed study of 6500 human genomes - Americans of European or African descent - did turn up something unexpected: the explosion of the human population over the past 5000-10000 years has resulted in a "vast abundance of rare genetic variants". "... the results suggest that humans are carrying around larger numbers of deleterious mutations than they did a few thousand years ago. But this doesn’t mean that humans now are more susceptible to disease, says Akey. Rather, it suggests that most diseases arecaused by more than one variant, and that diseases could operate through different genetic pathways and mechanisms in different people." One limitation of this study is that it only compared the protein coding sequences of the genomes it analyzed. 98% of our genomes do not encode proteins, so it's possible that whole genome analysis might have told a different story. In fact, I think it would be interesting to compare mutation rates in protein coding and non-coding sequences (some of which is functional, but much of which is junk). Original paper: Fu, W. et al. "Analysis of 6,515 exomes reveals the recent origin of most human protein-coding variants" Nature Advance online publication, http://dx.doi.org/10.1038/nature11690 (2012). Despite what you might see in science fiction movies and CSI-like TV shows, the DNA double helix is not usually visible under a microscope. 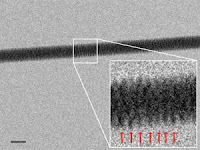 In fact Enzo di Fabrizio and his colleagues at the University of Genoa were able to take high resolution photographs of double stranded DNA using an electron microscope in which the DNA double helix is clearly visible. The image is actually not a single molecule of DNA - it's six DNA molecules wrapped around a seventh, since the energy of the electron beam can break a single DNA molecule. It's hoped that in the future a single DNA molecule can be imaged. Last, but not least, a team of French physicists lead by Jean Michel Arbona have designed a new computer model that describes how DNA can fold and knot and weave together into 3-dimensional structures known as DNA origami. See the video here for more details. Going to Mars: are we humans fit to make the journey and when we arrive will there be life there? Inlet covers for sample analysis at Mars. Are we humans prepared to travel to Mars? And if we are, will we find life when we arrive? What has the Curiousity rover found on Mars? The Mars Science Laboratory team has made some tantalizing hints about a "historic" and "Earth-shaking discovery made in a Martian soil sample. We won't actually know what they found until it's announced at the American Geophysical Union meeting in early December. Some intriguing possibilities are organic compounds, liquid water, or even microbial life. Hopefully the announcement will live up to the speculation. Even if it turns out that something less spectacular than life, any major finding is sure to inspire more calls for a manned mission to Mars. Humans, the argument goes, are more adaptable than mere machines. But I think the real appeal is to expand the boundaries of human territory and to say that we've been able to do it. But some people have even bolder plans for Mars. 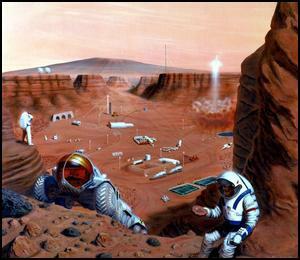 Billionaire Elon Musk, founder of the private space flight company Space X, has proposed human colonization of Mars. He envisions a "self-sustaining civilization" of up to 80,000 on the red planet, with colonists paying an "affordable" $500,000 for the trip. Of course the space ships are still under development. It's not clear when they would be ready for even a small-scale mission with a crew of ten. And then there's the human factor. At least the first few manned missions to Mars are likely to be relatively rough compared to what later colonists are likely to experience. The journey would take anywhere from 150-300 days, with extended periods of weightlessness and - possibly more importantly - extreme isolation for the crew. The astronauts aboard the International Space Station have been carefully monitored to help understand the physiological effects of living in microgravity. It takes a serious toll on the human body: bone and muscle mass are lost, vision can degrade, and some astronauts suffer debilitating space sickness. But up until now stays aboard the ISS have be relatively short. It was just announced that two astronauts - American Scott Kelly and Russian Mikhail Kornienko - are scheduled to begin a year-long stay on the ISS in early 2015. Tests and experiments will be run to determine the physiological effects of such a long stay in space. That will hopefully give scientists a better idea if the human body will be able to tolerate a long journey to Mars under weightless conditions. 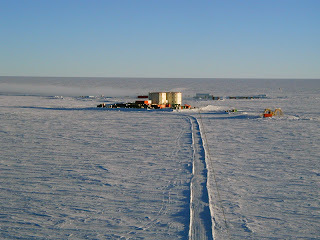 And the effects of living in isolation with a small group are being tested in Antarctica. The scientists at Concordia Research Station in Antarctica are completely isolated for nine months of the year in the most extreme environment on Earth. Even in summer the outdoor temperatures rarely rise about -25°C. In the winter the temperature can fall to -80°C (-112°F) and there is darkness around the clock. "I have learned a lot about Antarctica, myself and, of course, what might lie ahead on Mars. If we can make the journey, why would we go? And, as we have debated into the wee night hours, should we go?" I think that's the ultimate question: even if we can make a Mars should we expend the resources and risk the lives of astronauts to do so? And would the discovery of possible life on Mars make a difference? I admit I really like the idea of a human colony on Mars, but I'm not sure if that's just a romantic notion from having read too many science fiction novels. Even Kim Stanley Robinson's Red Mars, which shows the terrible difficulties - both human and technical - of colonizing Mars doesn't suggest we shouldn't try to go there in the first place. Even if it's hard I think we should go. And heck, if given the opportunity, I think I would go, even if there aren't little green men. I guess I should be saving up so that I have a spare $500,000 when tickets go on sale.